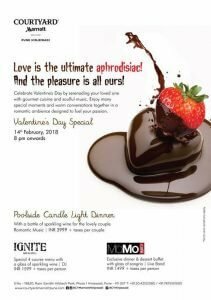 Spend Valentine’s evening by serenading your loved one with gourmet cuisine and soulful music at Courtyard by Marriott Pune Hinjewadi. With our specially crafted aphrodisiac menu, soulful music and a bottle of wine experience a magical evening at Poolside. Enjoy a lavish dinner buffet, a live band and specially crafted dessert with a complimentary glass of sangria at MoMo café. specially crafted desserts and DJ music.